A Hot Meal Without Fire! This hunting season, hunters are facing restrictions regarding what they will be able to do in the woods because of the high fire danger. A lot of us hunters will find that these restrictions will include no campfires on which to cook our meals. Well, we have a solution which will give you a hot meal without the fire, plus two bonuses. First, you will find it much quicker and easier to have that hot meal ready after a hard day of hunting. The second bonus is the meal will taste good. Here is the solution. 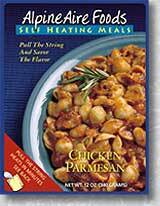 AlpineAire Foods has Self Heating Meals. All the entrées are fully prepared and cooked meals that are sealed in their own disposable dish. These meals contain no preservatives or MSG and come complete with utensil, napkin, salt and pepper. which when pulled, releases the saline onto the magnesium wafer. The wafer will begin to heat up as it reacts to the saline. This reaction creates steam, which in turn heats the meal in approximately 15 minutes. What makes this such a great product? These meals have a shelf life of 18-20 months, without refrigeration, and are prepared by simply pulling the string. Here is a list of the available meals: Chicken Pasta Parmesan, Turkey Chili, Vegetable Beef Stew, Five Bean Casserole, Lemon Herb Chicken Breast with Rice, and Spaghetti With Meatballs. In fact, you don't even have to be in the woods to get the benefit from these meals. After a long, hard day of walking by 2,000 booths at the SHOT (Shooting Hunting and Outdoor Trade Show) last January, we returned to our hotel room tired and beat. During the day I had stopped by the the AlpineAire Foods booth and talked with Russ Sonneborn, Director of Sales, about their products. Russ had given me a sample package of the Chicken Pasta Parmesan. Well you guessed it  rather than leave the room we pulled the string on the Self Heating Meal and in 15 minutes we were having a hot meal while still resting our feet. You can be sure I will have some of these meals with me these year when I head to Eastern Oregon for archery season. 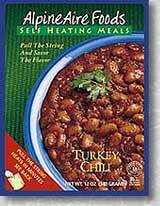 If you want to find out where you can purchase these meals, go to www.AlpineAireFoods.com and click on the Dealers button to get a listing of the places that carry the Self Heating Meals in your area.